Lovely cabin, location, amenities far beyond what I'm used to. Could have used a bit more counter space but it's a small kitchen so I made do. Otherwise, a delightful place where I hope to return next year. The home was in great condition. The interior had some parts that were a little dated, but it that is to be expected, it is a cabin after all. 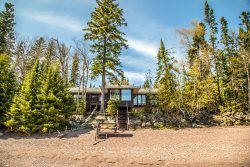 The location was amazing, the view was one of the best in the entire area including what we saw of the ones on Lake Superior. The seclusion is by far my favorite part of this particular rental property. The service was excellent as well. We had a bed break while we were there and they had someone there to take care of it right away. Overall it was a perfect weekend getaway. The home was comfortable and had all the basic necessities, except for a small frying pan, which I realize is a bit nit-picky. We loved being able to walk everywhere. That was a big plus. The deck was great when the mosquitoes weren't out. Beautiful location with the full moon over the lake was breathtaking.